Donation of 1932-33 ‘Bodyline’ Signature Bat By John Clancey | The International Cricket Hall of Fame. 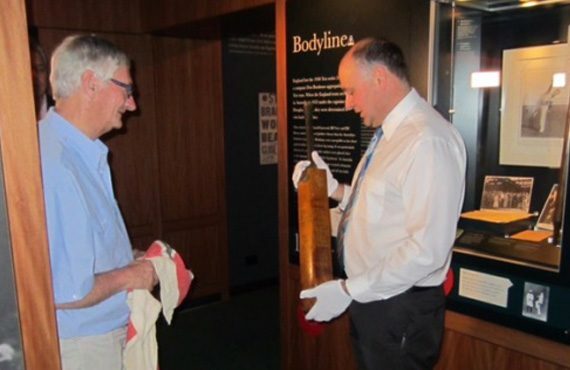 A bat with a fascinating story was donated to the Bradman Museum. John Clancey travelled all the way from Bendigo (Victoria) to donate an historic bat that he has held for over 50 years. During the famous ‘Bodyline’ Ashes series when fast bowlers Harold Larwood and Bill Voce were peppering the Australian batsmen, including Don Bradman, with lethal short rising deliveries aimed at the batsman’s body, John’s father Bill won the bat in a ‘two-bob’ raffle. It featured the original signatures of both England and Australia. The bat was shared around the Clancey family and apparently was even used in some back-yard cricket matches before being given to John in 1965. Mindful of the bat’s historical significance, John ‘retired’ the bat and carefully guarded it for decades. On a recent trip up north he visited the museum and, impressed by it, decided that it should be the bat’s final home. The bat is on display in the Museum’s dedicated ‘Bodyline’ gallery. The donation has inspired several other families to contact David and have since made generous object donations during December.